Tres Hofmeister Sensei is ranked nanadan (7th degree) in Aikido. He is a student of Mitsugi Saotome Shihan and Hiroshi Ikeda Shihan. He began his training in 1978 and entered Boulder Aikikai under Hiroshi Ikeda Shihan in 1980. Hofmeister Sensei is a senior instructor for Aikido Schools of Ueshiba (ASU), teaching regularly at Boulder Aikikai and at seminars throughout North America and abroad. Hofmeister Sensei is also a certified practitioner of the Feldenkrais Method®. 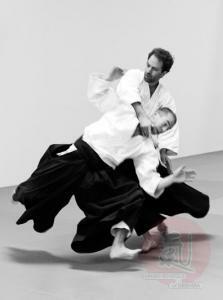 He has a particular interest in the process of learning in Aikido and its relationship to self-understanding.